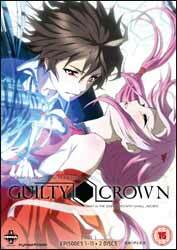 Guilty Crown is a 2011 TV anime with an odd conception: despite its conventional storyline and the presence of several seasoned studio hands among the staff – more of whom later – it saw broadcast in the Noitamina slot of Fuji TV, a weekly hour reserved for odder and more unconventional anime forays; the effective horror Shiki, political fantasy Eden of the East and literary detective drama Un-Go are just a few of its better-known features. With its high budget, transmedia music tie-ins and splashy widescreen action aesthetic, Guilty Crown stands out from the Noitamina roster like a Michael Bay blockbuster at an indie film festival. Sad to relate, this isn't the only comparison with that most bombastic of Hollywood directors to come to mind while watching. The cynical feel of committee-driven TV, striving for as broad an appeal as possible, permeates the series, with the result that the scenes of atrocities against civilians and terrorist violence feel empty and weightless. The characterisation is similarly hollow, the female characters coming off poorest of all - heroine Inori emerging as a lifeless fusion of Macross' world-saving songstress Lin Minmei and Evangelion's schizoid, doll-like Rei Ayanami, yet lacking the charm or nuance of either. Inori and the other female cast members are frequently and exploitatively sexualised throughout for the audience's delectation, the worst indignities reserved for headstrong mecha pilot Ayase; despite her competence as a resistance fighter and her pride in her identity as a paraplegic wheelchair-user, her disability is fetishised at numerous points, depriving her of agency and forcing her to rely on Shu for support. It's a deeply distasteful treatment that throws away any pretensions to positively portraying disabled characters the show might have had. With all that in mind, it's hard to find much to say in Guilty Crown's favour, yet the show does at least make the most of its extravagant production values. Director Tetsuro Araki shows the flair and wilful lack of subtlety familiar to fans of his other hit series, Death Note and Attack On Titan, while the music score by Hiroyuki Sawano (AOT, Gundam Unicorn) with his signature power ballads powers along more effectively than the insert songs for Inori by pop ensemble Egoist. When all the show's strengths are assembled, the result is some genuinely arresting action sequences, the zero-gravity fight in episode four being one such highlight. Ultimately it's hard not to feel that whatever its superficial virtues, Guilty Crown is too empty and cynical to excite much genuine loyalty. The nasty aftertaste left by the treatment of the female characters is too strong to shake off, even by the anime industry's low standards, and the show's strengths are all to be found in better and more interesting series that have gone before. One to pass by.